Artists take back the night and the day in new CJM exhibit – J. For those of us who are oriented toward the light of day, visual artist Lisa K. Blatt kindly requests that we readjust our eyes toward the light of night. That’s when things get really interesting. Blatt, whose work is part of the arresting new exhibition “Night Begins the Day: Rethinking Space, Time, and Beauty,” at the Contemporary Jewish Museum, says she has always been fascinated by what takes place as the skies darken. Blatt’s 2012 video “clearest lake in the world” is one of three nightscapes that came to mind when CJM chief curator Renny Pritikin was contemplating his first major exhibit with CJM associate curator Lily Siegel. As he and Siegel were conceiving the exhibit, Pritikin, a published poet who recently celebrated his first year at the museum, learned the Hebrew word “yir’ah” during a Jewish studies session. The word has no direct English translation but is used by Jewish scholars to refer to a state of awe, beauty, love and fear — a transportive place, much like the staircase to heaven in the dreams of the biblical patriarch Jacob. The ambitious show features the works of some 20 individual artists and artist collectives spanning the globe and media who address the timeless question of what it means to experience the sublime — a state outside of oneself. From Vanessa Marsh’s chromogenic photograms of nocturnal skyscapes and Masoon Kamandy’s “Pools,” overhead shots of backyard suburban swimming pools glowing in the dark (the other two night landscapes, along with Blatt’s, that Pritikin had been “carrying in the back of my mind” before the exhibit took shape), to Josiah McElheny’s “The Center Is Everywhere” — a brass and cut-lead crystal light fixture on which each piece of glass represents an elliptical galaxy — “Night” dares viewers to question and define for themselves moments of genuine transcendence in a world of Twitter, Facebook, Instagram and reality TV. The exhibit is at once challenging to the eye, the mind and the heart, says Nathaniel Deutsch, a professor at U.C. Santa Cruz and co-director of its Center for Jewish Studies. Deutsch’s essay “A Jewish Sublime?” is featured along with essays by Pritikin, Siegel and Bay Area writer Dodie Bellamy in the show’s exquisite catalog. The CJM has taken the biblical concept of “yir’ah” — which dates back to the binding of Isaac at Mount Moriah — and given it a fresh, relevant and entirely Jewish interpretation, Deutsch observes. Traditional Christian concepts of transcendence often link depictions of nature, like a pastoral landscape by John Constable, to a human being’s relationship with a heavenly being. But in this CJM exhibit, videos, collages, computer-generated art and other multimedia work are used to expand one’s understanding of what it means to achieve an elevated consciousness and connection with the Divine. “There is a way in which new technology allows us to gain a kind of transcendence,” Deutsch says. Examples of this abound in the exhibit, such as Robert Kooima’s still from “Total Perspective Vortex,” an electro-application capable of rendering a database of 2.5 million stars in real time, and Daniel Crooks’ “A Garden of Parallel Paths,” a still featuring single-channel high-definition video, color and sound. The exhibit’s title, “Night Begins the Day,” refers to the Jewish tradition that considers each day as beginning the evening before. So, with more than a nod to the metaphorical as well as literal meaning of vay’hi erev, vay’hi boker (it was evening, it was morning), they fashioned an exhibit that — as in the works of Blatt, Marsh and Kamandy — heavily emphasizes the wonders that become evident only at nightfall. According to Rabbi Peretz Wolf-Prusan, senior educator at Lehrhaus Judaica in Berkeley, the rabbis of early times had a deep understanding of astronomy: After all, the Jewish calendar follows the lunar cycle, and called upon Jews “to observe nature and be a part of this world. 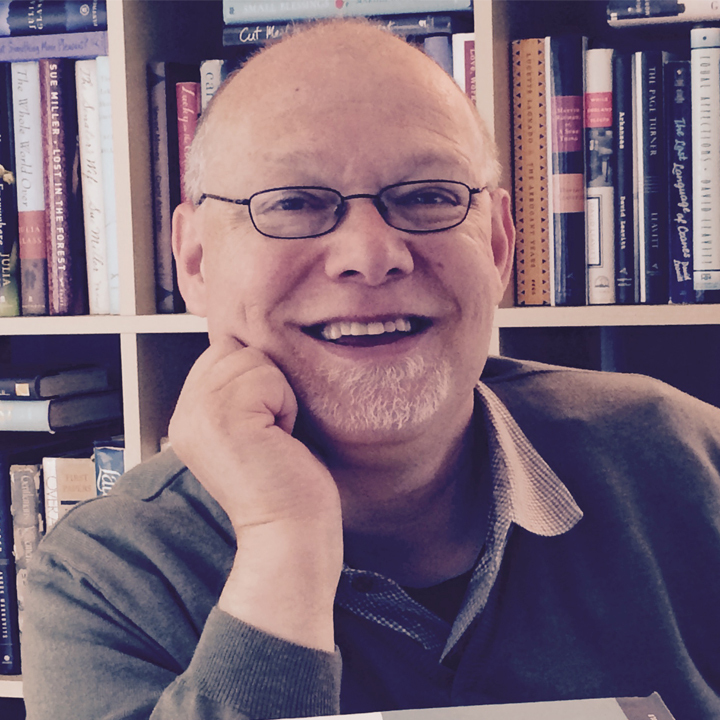 Invoking the words of the late scholar and civil rights leader Rabbi Abraham Joshua Heschel, who spoke of the need for “radical amazement” — a sense of wonder that is a prerequisite to wisdom and faith — Wolf-Prusan echoes Blatt in waxing exuberant about what can be discovered in the dark. The night is not to be feared, but to be venerated. Blatt captured the footage for “clearest lake in the world” on an expedition to South America, where she came upon a nocturnal wonder: a shimmering lake in Chile. In “clearest lake,” viewers see the night sky reflected on the water’s surface. But the images — and viewers’ perceptions — continually shift, as a small breeze causes fluctuations in the light and shadows on the water. Because Blatt is interested in the interplay between still and moving images, nature and culture, and perception, “clearest lake,” with its ever-changing perspectives, seems not only wholly appropriate for an exhibit challenging viewers to reconsider what night and darkness represent, but also completely suitable for a museum with “Jewish” in its title. “A lot of Judaism is about questioning,” says Blatt. CJM executive director Lori Starr says the exhibit represents “a new stage in the maturity of the institution.” The fact that “Night Begins the Day” is being mounted during the museum’s seventh anniversary in its Mission Street building is noteworthy, she says, because “we are in our shmita year.” Shmita, in Jewish law, is the seventh year in a seven-year agricultural cycle, during which crops are left untilled. New, exciting developments often sprout at such a time, Starr suggests. “Night Begins the Day,” which runs through Sept. 20, includes a number of related educational programs, including a 6:30 p.m. July 9 exhibit discussion with Pritikin, Siegel, Wolf-Prusan and Bellamy, as well as a series of noontime “gallery chats,” starting with a 12:30 p.m. July 10 talk by Siegel on the paintings of Moira Dryer. 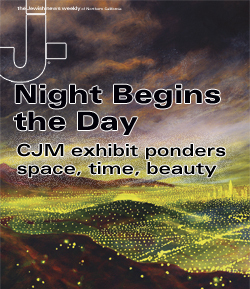 “Night Begins the Day: Rethinking Space, Time, and Beauty,” through Sept. 20 at the CJM, 736 Mission St., S.F. www.thecjm.org.